Oahu means the gathering place. That is indeed where people have gathered. We do Oahu weddings. You should take a look at our wedding packages and locations pages. 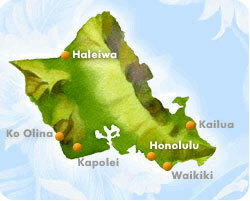 Oahu is famous for Waikiki, Pearl Harbor and large wave surfing on the North Shore. 95% of our guests stay in the Waikiki area where we have a wonderful beach wedding location called Duke Kahanamoku. Although this is not where everyone does weddings. Many take a drive or limo the Waialae Beach park or perhaps to one of the more famous and publisized beach locations; Lanikai beach. Their are also some newer resorts in the Ko'Olina area wher we have a nice Marriott and Disney's Aulani Resort. If staying in that area we use a beach location called Paradise Cove. Lot's to see and do on Oahu so this is a good choice for a Hawaiian style wedding. Usually easier to get to than the other Islands makes Oahu less expensive. Many of our clients can ge away with not having a rental car something we would never suggest for any of the outer Islands. Choose your location: We assist you with wedding location advice. We offer beaches and the requisite permit, parks, waterfalls, churches and other private venues. Choose your vendors: We give you choices for minister, photographer and more... Our vendors have been selected based on experience, professionalism, excellence and their dedication. Choose a package or customize: We offer a variety of pre-determined packages that very popular. These wedding packages can give you an idea of our price but do know we customize the majority of our weddings. Hawaiian Style Weddings offers a turn key wedding service. First class service at a great price. Pick a package or customize to suit your needs. Our weddings use only the best, independent, high quality vendors. You get to choose from many ministers, photographers and more... We get all the necessary permits, you simply need to show up. Get your Free Quote Today! We do Travel: We can help with all your Hawaii needs. We are experts in Hawaii. Our travel services include air, room and car packages and our activity expert can help you plan your fun all at a great discount. We also do vow renewals, committment ceremonies and offer reception help too! Get Married in Oahu by Hawaiian Style Weddings.